This heart-pounding finale of World Fantasy Award finalist Kate Elliott's Court of Five series forces Jessamy to confront an inescapable truth: with or without her, the revolution has begun. 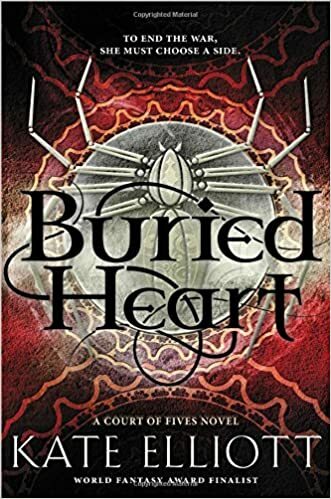 My Thoughts: BURIED HEART was a good conclusion to the Court of Fives trilogy. Jessamy is torn between her Seroese father and her Afean mother in a culture ruled by the Seroese. As a mixed blood person, she is not accepted in the Seroese culture except that she is an excellent player in the game of fives which obsesses Patron and Commoner alike. She is also beloved of Kalliarkos who is very closely related the the rulers of the country which doesn't endear her to either group of people. She needs to decide where her loyalties lie since she knows that there is a revolution brewing among the Commoners and lots of intrigue among the Patrons will have an impact on Kalliarkos. Since she was instrumental in freeing her mother, her siblings, and their servants from being entombed alive with a dead Patron by Lord Gargaron, she is in extreme danger. When Lord Gargaron captures her and stuffs her in a barrel (which hits just about all of my panic buttons), he forces her to help him woo armies from other countries that he wants to help him take control of the country. He puts Jessamy in a isolated mining prison to keep her until he needs her again. This is where she really becomes a revolutionary for Efea as she coordinates a prison takeover and escape. The story has interesting revelations, lots of battles, lots of plotting, and a nice romance. Fans of epic fantasy will enjoy this whole trilogy. She can't disguise the fear in her voice: She's not sure if my loyalties lie with her or with Father. With Efea or with Efea's Saroese rulers. The truth is, for all my bold words, I'm not sure either.